Remove the clutch cover. Refer to “clutch removal” in section 5c . Remove the washers (1), starter idle gear no. 1 (2) And no. 2 (3). Remove the starter idle gear no. 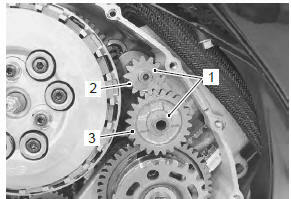 2 Bearing (4), shaft (5) and washer (6). 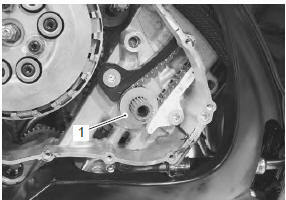 Hold the starter clutch with the special tool and remove the starter clutch bolt. 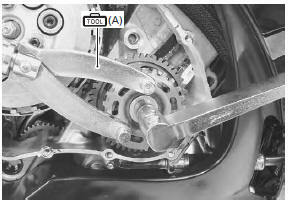 make sure that the pawls of the special tool are inserted into the holes of the starter clutch. 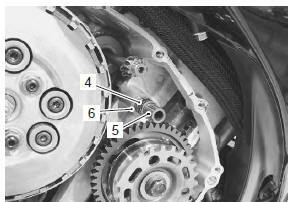 Remove the ckp sensor rotor (7) and starter clutch assembly. install the washer (1) to the crankshaft. 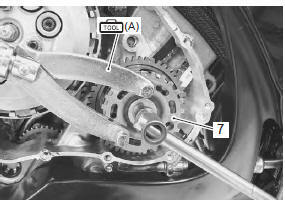 When installing the starter clutch and ckp sensor rotor, align the wide spline tooth of them with that of crankshaft. 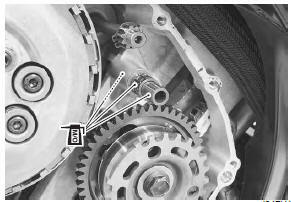 Hold the starter clutch with the special tool and tighten the starter clutch bolt to the specified torque. Apply molybdenum oil solution to the starter idle gear no. 2 Bearing, shaft and shaft hole.